Sen. Cindy Hyde-Smith, R-Miss., gestures toward President Donald Trump during a rally in Tupelo, Miss., Monday, Nov. 26, 2018. 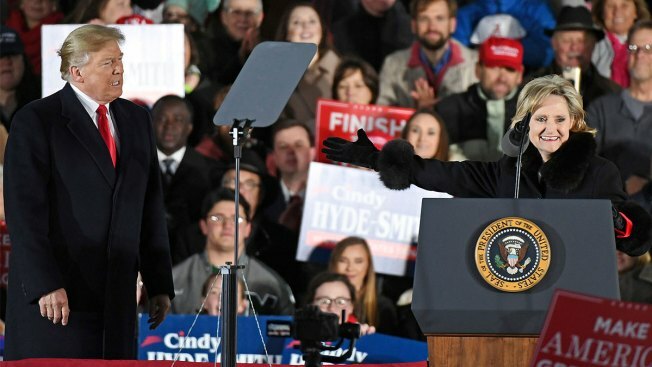 President Donald Trump rallied voters Monday for Republican Senate appointee Cindy Hyde-Smith who has found herself in a closer-than-expected runoff contest after comments she made about attending a public hanging drew condemnation. As Trump praised Hyde-Smith at two high-profile rallies in different parts of the state, her opponent, Democrat Mike Espy spoke at a predominantly African-American church and described his campaign as an effort to reach across the "chasm of racial division." The runoff election Tuesday will decide who serves the final two years of a term begun by Republican Sen. Thad Cochran, who resigned in April amid health concerns. The historic contest features Hyde-Smith, who would be the first woman elected to Congress from Mississippi, against Espy, who's vying to become the state's first black senator since Reconstruction. It's a contest that has been buffeted by racial tensions after Hyde-Smith's public hanging comments. And the tensions continued right up until Election Day with the discovery of seven nooses and six handwritten signs on Capitol grounds Monday morning. It was not immediately known who put them there. The signs referred to the state's history of lynchings and the Senate race. One sign said Mississippi needs a senator "who respects the lives of lynch victims." At rallies in Tupelo and then in Biloxi, Trump praised Hyde-Smith and called on voters to send her back to Washington. She was appointed by Gov. Phil Bryant to fill the senate seat after Cochran retired. "She votes for us and she votes for 'Make America Great Again,'" Trump said in Tupelo, where he was accompanied by Hyde-Smith. "She stood up to the Democrat smear machine," Trump said, praising her for voting to confirm Brett Kavanaugh to the Supreme Court. Hyde-Smith, who has made the Trump rallies a highlight of her runoff campaign, told the crowd in Tupelo: "I worked very, very hard for you. I have stood up for you and you know I will continue to stand up for the conservative values of Mississippi." But race has become a dominant issue as Hyde-Smith faces Espy, a former congressman and U.S. agriculture secretary. Hyde-Smith has drawn fire for a photo showing her wearing a replica hat of a Confederate soldier, and a video showing her praising a supporter by saying, "If he invited me to a public hanging, I'd be on the front row." Mississippi has a history of racially motivated lynchings and violence against people who sought voting rights for black citizens. About 38 percent of the state's residents are black. Espy is trying to boost their turnout and pick up support from white voters who are uneasy with Trump or the racially tinged stories about Hyde-Smith. Espy spoke for nearly 30 minutes Monday to a crowd of about 200 people gathered at church in Jackson. He called on his supporters to go out to vote on Tuesday "like it's a holiday." "We've got a job to do. We need to come out tomorrow in such numbers, such strength, marching to the polls like it's a holiday," he said. "This is a campaign that goes to the color line and it reached across the color line, across the chasm of racial division, across the chasm of racial acrimony," Espy said, saying blacks and whites share common concerns in the issues he's centered his campaign on, such as health insurance, student debt and jobs. "If we win tomorrow, we'll be at 53-47 which is substantially more than we had," Trump said. He said of Espy, "Oh, he's far left, he's out there. How does he fit in in Mississippi?" And he told the crowd, "don't take any chances" by not voting. Hyde-Smith's support of Trump is unmistakable. She used both her opening and closing statements of the only debate of the runoff campaign to promote Monday's presidential rallies, citing the online address to get tickets. Even on trade and tariffs, where Trump's decisions could hurt Mississippi farmers, Hyde-Smith praised the president. After the event in Tupelo, best known as the birthplace of Elvis Presley, Hyde-Smith and Trump flew to the Gulf Coast for a larger rally in Biloxi where thousands of Trump supporters were waiting. "Cindy Hyde-Smith will support President Trump's agenda, and President Trump's agenda includes a better America for all of us, every state, including Mississippi," said Virginia Olander from Bay St. Louis. About 100 anti-Trump protesters were also there, chanting "Impeach 45" as they held signs with red strikes through Hyde-Smith's name. Espy has emphasized that he's a moderate seeking the votes of everyone and willing to work across party lines. He noted during a campaign stop earlier Monday that he had crossed the "party chasm" to endorse the re-election of Republican Gov. Haley Barbour in Mississippi in 2007. Former Vice President Joe Biden endorsed Espy, and three Democrats who could run for president in 2020 — Sens. Kamala Harris of California and Cory Booker of New Jersey and former Massachusetts Gov. Deval Patrick — have been to Mississippi to campaign for the former congressman who served as agriculture secretary in 1993 and 1994 under Democratic President Bill Clinton. For Espy, turnout is key. 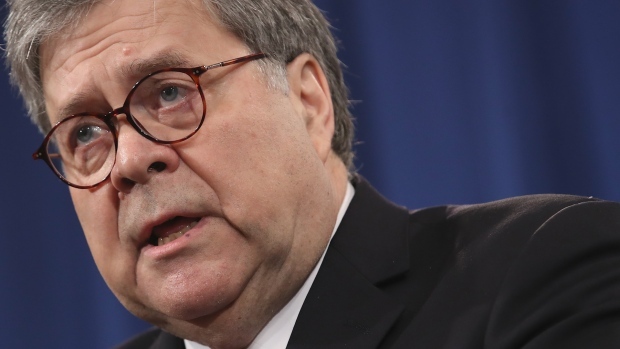 He must close the gap in a state where Trump received 58 percent in 2016. Mississippi hasn't elected a Democrat to the U.S. Senate since 1982. Hyde-Smith has apologized to "anyone that was offended" by the hanging comment, saying she meant no ill will. She and her campaign have refused to discuss the Confederate hat. Trump defended Hyde-Smith Monday. He said the comment was "a little flip" but said she apologized and that he'd "heard that loud and clear." He said he knows "where her heart is and her heart is good." AP video journalist Stacey Plaisance contributed to this report.